The skeleton of a horse thought to be from the Roman period has been discovered at the Biomedical Campus in Cambridge – three metres below ground with a broken leg. Archaeologists said finding the almost complete skeleton was "unusual" and was an indication that a "specific incident" must have occurred in the past for it to be unearthed still fully intact. The skeleton, which is about 2,000 years old, was found three weeks ago during preparatory work on the site of a new hotel and conference centre. 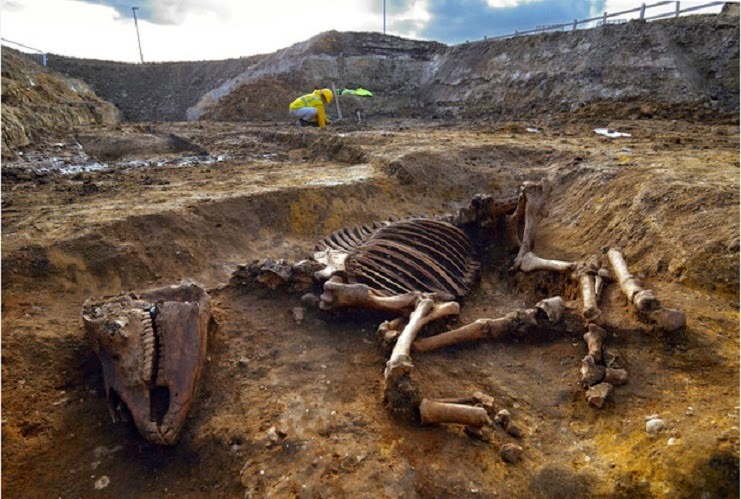 Alison Dickens, archaeological manager at the Cambridge archeology unit at Cambridge University, said a full analysis had not yet been carried out but initial investigations by an animal bones specialist found it was a horse about one-and-half metres high. "It was a really nice thing to find," she said. "It has a broken leg which had started healing but hasn't fully healed but that's probably why it's ended up where it's ended up. "It's almost a full skeleton, it had been slightly damaged perhaps in the 1960s when the ground was being prepared and landscaped when they were building the new Addenbrooke's Hospital. "The material that was excavated out when they dug out the basins of the building, they dumped a lot of the material in the field next door in 1966. The bones were about 40-50cm below ground level but with all that dumped on top they ended up three metres below ground level." Although experts have not yet analysed the skeleton in detail, they believe it is from the Roman period as it was found near a Roman settlement which was discovered 12 years ago. "It was in a pit around it which we think were dug for quarrying gravel in the Roman period," said Alison. "The other signs were fragments of pottery and fragments of other animals. It was probably just on the edge of a settlement, there is certainly a Roman settlement to the north of it and it's in the general area of Roman activity." She added: "We find animal bones everywhere but finding a whole one intact is slightly more unusual but you do find them. A specific incident must have occurred in the past as to why it is there. Maybe it was ill or diseased, maybe it died or it had to be put down. We just don't know at the moment." Dr Keith McNeil, chief executive of Cambridge University Hospitals, said: "It is a fascinating discovery. The horse may have been just a workhorse for the quarries, which supplied construction materials for the nearby Roman settlement, or it might have been someone's prize thoroughbred; we won't know until tests are done. Either way it is a humbling reminder of our past and where we have come from. "2000 years later and on the ground where this horse was discovered we are due to start building 'The Forum' - a conference centre, hotel and hospital complex. Our Forum, like the Roman equivalent, will be a place where experts from around the globe will debate and discuss, but here they will work together on new ways to treat patients and collaborate on creating life-changing treatments and technology."